October 29, 2009- At 15:49 the Schuylkill Haven R.I.T. was was dispatched to 908 West Race Street, Pottsville, for a house fire. Chief 722 was first on the air and got additional of a working kitchen fire at the above address. However, before Engine 733 and Squad 739 could get off their apron, they were placed available by Pottsville incident command, P-2. stating that the fire had been extinguished. October 29, 2009- At 08:58 stations 1 & 2 were dispatched to the rear of 404 East Main Street, Schuylkill Haven Borough, for a vehicle fire. Chief 722 was first to arrive on location and advised County Comm. Center and all incoming units that the fire appeared to be extinguished, and asked to have everybody come in “normal flow”. The Chief cleared himself, Engine 732 and Ladder 725 within about 10 minutes. 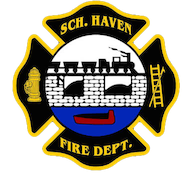 October 27, 2009- At 20:41 the Schuylkill Haven Fire Department was dispatched to 62 Seven Stars Road, North Manheim Twp, for an automatic fire alarm (Cotton Club). Duty Chief 722 (Sattizahn) was first to arrive on scene, and was met by a representative from the club to advise him that the system was being worked on and it wasn’t reported by the alarm company. Chief Sattizahn cancelled off all the rigs en route and was cleared within 5 minutes. October 24, 2009- At 10:02 Rescue 727 was dispatched to assist District 41 (Cressona) at 334 Chestnut Street, North Manheim Twp, for a vehicle accident with unknown injuries or entrapment. As units arrived on scene, they noticed the vehicles still on the road with minor injuries and no entrapment. The rescue continued to roll in and remained on scene for about 25 minutes. October 22, 2009- Commercial Fire at Dock Street and Center Ave.
October 22, 2009- To end an already busy day: The “beeps” came in again!! This time, sending the entire department to the intersection on Dock Street and Center Ave. for a commercial structure fire (Keystone Door and Window). Luckily, there was a small fire in the corner of the building and it was quickly extinguished by the first in truck, Ladder 725. Crews used thermal imaging cameras to check for any extension, and also pulled off siding off the building to hit the remaining “hot spots”. Everybody was on scene for about 35 minutes. October 22, 2009- At 16:35 County Comm. Center notified Duty Chief 720 (Peel) of an incoming Automatic Fire Alarm at 311 St. John Street, Schuylkill Haven Boro. Since most of the department’s apparatus was still at the original call on Caldwell Street, Chief Peel asked to have the additional available units to respond to the scene on St. John Street. Engine 733, Tanker 738 and Squad 739 arrived on scene to find that it was an alarm that was tripped due to the power outage. Units were on scene for about 5 minutes. October 22, 2009- For the remaining apparatus that weren’t on scene at the previous Medical Assist: Engine 733 and Squad 739 were sent to the Grace Evangelical Church at 9 Earl Stoyer Drive, Schuylkill Haven, to set up a landing zone for incoming Medevac 7. Firefighters assisted EMS with transporting the patient to the “chopper” and cleared the scene soon after take off…..
October 22, 2009- A VERY LONG DAY FOR THE S.H.F.D. At 15:16 the Schuylkill Haven Fire Department was dispatched to 200 Caldwell Street, Schuylkill Haven Electric Sub Station, for a medical assist/power outage. Crews arrived on scene to find a transformer on fire and person who had been electrocuted. Everyone on the scene assisted with patient care and assisted Medic 63-01. Once the patient had been packagedinto the ALS truck, crews remained on scene to secure the scene and the medic truck headed to the awaiting Landing Zone and Medevac 7. October 22, 2009- At 10:20 stations 1 & 2 were dispatched to 200 Route 61, North Manheim Twp, for a vehicle fire (near Red & White Market). Chief 720 was first to arrive on scene and gave additional of breaks burning on a tractor trailer. Chief 720 had Engine 732 roll up on scene and cancelled of station 1. They remained on scene for 15 minutes. October 20, 2009- At 11:18 stations 1 & 2 were dispatched to the area of 34 East Liberty Street, Schuylkill Haven Boro, for a motor vehicle accident with injuries. Chief 720 arrived on scene to meet up with SHPD and confirmed to County Comm Center of a 1 vehicle accident with no injuries, with a vehicle into a pole. Since there were no injuries, Rescue 727 was cancelled en route and Engine 733 continued into the scene. The Schuylkill Haven Line crew was sent to estimate the damage to the pole and all units remained on scene for about 10 minutes before being released.